Jonah in the Hamster Wheel! As morning dawned, there was thunder, and lightning, and a dense cloud settled upon the mountain. . . while Moses approached the thick cloud where God was. Of course the Torah is speaking metaphorically here. God does not actually live behind a cloud on a mountain somewhere on the Sinai Peninsula. But God is, more often than not, hidden from us. Veiled. Shrouded. A Mystery. For those who seek absolute clarity, who like things black and white, this can be deeply frustrating. But as many spiritual seekers have noted, it is precisely God's mysterious nature that allows for subtlety, complexity and paradox in human life. If God was too obvious, in plain sight, then faith would be too simple. So, too, with our rites and rituals that strive to bring us close to the Holy One of Mystery. Sometimes, we lament that there are parts of our service that we do not understand. We may be frustrated with the Hebrew, unfamiliar with the choreography of Jewish prayer, or just perplexed by certain traditions and practices. Needless to say, much of this can be ameliorated with some simple explanation, translation, and a commitment to regular attendance and learning. "Here's the deal: do you really want to go to a church for the first time and understand everything that's going on? Do you really want to walk into the most sacred hour of the week for an ancient spiritual tradition and find no surprises and nothing to learn or strive for? Do you really want a spiritual community to be so perfectly enmeshed with your cultural expectations that you can drop right into the mix with no effort at all. . . I do hope you'll give this a little more effort than that. Because something wonderful can happen when you stop trying to figure out what you should be doing in a worship service. When you admit to yourself that you don't know what's going on, you'll just sit and listen. Because that's really all you can do. And that's actually a very nice spiritual move for you to make." God is behind the cloud--as She should be. Sometimes the hiding is what makes for the joy of the finding. And sometimes, as Iris Dement sings below, it is enough to just "let the mystery be." Spiritual progress is rarely linear. In life, unlike in the movies, there are no simple “happily-ever-after” endings or instant and enduring transformations. Instead, we take a few hard-won steps forward, fail and fall back, and then, hopefully, regain the lost ground and continue to forge our way, intermittently, ahead. The Israelites shuttle wildly between fear and faith, hope and despair, cowardice and courage. Our challenge is to remember that even the failures are part of the journey that will eventually take us toward the Promised Land. There are no shortcuts. As Torah teaches, “Now when Pharaoh let the people go, God did not lead them by way of the Philistines, although it was nearer.” Instead, we walk a way that frequently winds back upon itself. The path that God chooses for us leads us into daunting obstacles that test and sometimes even turn back our progress. It is hard, confounding, and frustrating. How do we leave the narrow places? We think this is who we are? Our ancestors stood at the shores of the sea. And together they walked across the sea on dry ground. And the Israelites raised their voices and cried. And they stumbled in doubt, bitterness and fear. I love Israel, madly, beyond all reason. That’s the way it is with love. Love—the kind of love I feel for this land and its people—is not rational. It’s visceral. To love is to be in relationship, to feel a deep connection with the beloved. To hurt when the beloved hurts. To rejoice when the beloved rejoices. And so it is for me with eretz Yisrael. When Israel is in pain, I ache. When Israel is in danger, I fear. When Israel makes mistakes and shows poor judgment, I cringe. And when Israel demonstrates extraordinary virtue and restraint, acting as a moral exemplar despite the lousy neighborhood in which she dwells (as she often does, though the world is loathe to acknowledge this), I kvell. Because I love Israel, I spend much of my life defending her against her fierce critics, some of whom are, otherwise, my friends and allies on the political left. I advocate for her, with my money and my life. I send my children to learn and live in Jerusalem. And I have made Israel my own home, when I was a student myself, and when I have been on sabbatical. This is what one does for a loved one. Every morning, I search the newspapers and websites for stories from Israel. I want to know what is going on in this beloved place, where the Jewish smells and sounds and faces speak straight to my heart. I love the falafel—vegetarian fast food, everywhere!—and I love the beautiful young men and women in uniform, risking their lives for me and for the Jewish people everywhere, to protect and defend our Jewish state. Our beloved home. This part of my relationship is simple. It’s love. But here’s where it gets complicated: one can love someone or something dearly without really liking it very much. By way of example: most of us have family members who we love but don’t particularly like. That crazy cousin or uncle or niece or grandparent or brother or sister. . . whoever. . . . You love them and would do almost anything for them. You just don’t want to spend too much time with them. That’s how it is with Israel and me. After seven visits, some for many weeks or months, I have come to realize that as much as I love Israel, I don’t really like it very much. There are, of course, some things Israeli that I like very much, indeed: the rural Galilee and Golan, falafel bars, Shabbat and holy days, Elite chocolate, paddle ball on the beach, the radio programming. 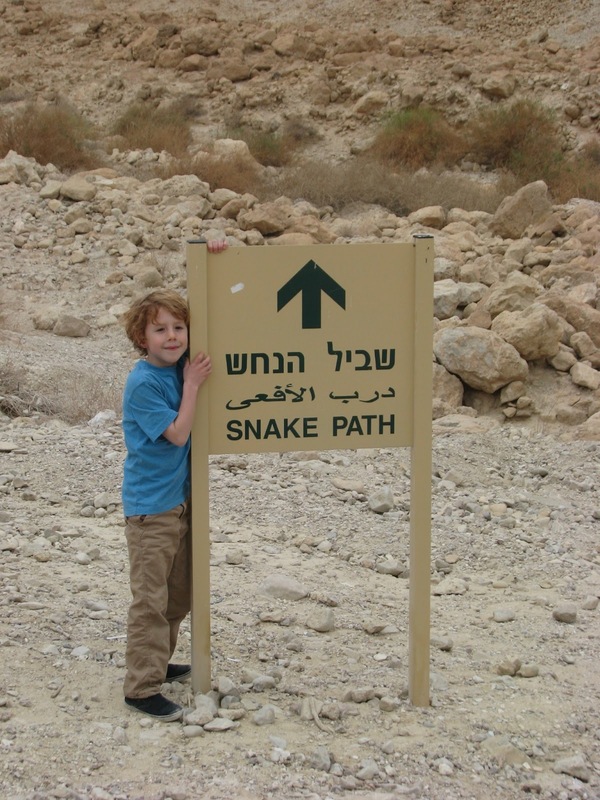 But mostly, I don’t like being in Israel, no matter how much I love it. I feel a thrill when the plane lands in Tel Aviv and everyone on board—including me—applauds. But I also feel a deep sense of relief when I get on my flight back to my home in Boise, Idaho, which I both love and like. 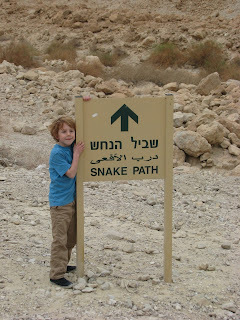 I don’t blame Israel for my lack of “like.” I am not passing judgment on this beloved place. I know that many people like it very much. Indeed, I see my inability to like Israel as a personal shortcoming. It’s just that Israel is, culturally, a terrible fit for me. It’s too small, too crowded, too constricted. I need more wildness, more privacy, more peace and quiet, and a lot more personal space than Israel and Israelis provide. I don’t have the stomach for confrontation and competition. I don’t like haggling and yelling and pushing and shoving—and if you don’t like these things in Israel, you don’t get very far. I like courtesy and stillness and order and respect for process. I like kindness to strangers. I like being able to yield in traffic to someone else without being taken for a sucker. I like being able to sit at a green light for a few seconds and having the person behind me wave politely instead of honking her horn. I like America, and Boise, Idaho, in particular. For most of my life, it has bothered me that, as much as I love Israel, I don’t really like it. But after this trip, I am starting to make my peace with this relationship. Israel is my family. It’s my first love. And if, as can be the case with family, you can love without really liking all that much—well, so be it. Family will always be family, and blood is thicker than water. So it is with me and my beloved Israel. The fact that I do not like her very much does not in any way diminish my deep and abiding love for her. This morning, we got in the car and drove to the airport, then went through security. Then we got on the plane. Our first flight that we are taking is twelve hours! When we left Israel, it was very, very windy. Trees were blowing over. Last night, before I went to bed, I said goodbye to everyone in my family. I was very sad to say goodbye to them, and it is hard to say goodbye. Tanya and Rosa came with us to the airport and they are going to Tel Aviv, so I said one last goodbye to them here at the airport. On the plane, I’ve been watching Ice Age and The Avengers. I’ve been really enjoying it. After me and Dada play chess on the plane, I will play a game on the TV. I’m looking forward to seeing Mom and Rachel very much. First thing in the morning, we went to the Dead Sea to some hot springs there, filled with some water from the Dead Sea. I floated SO much! The water was very, very salty. I did swallow some and it got in my nose. That was very painful. Then, after we got out of the hot springs, we dried off. Then me and my dad and Rosa went down to the Dead Sea. It was cold outside. When we got to the Dead Sea, we put some mud on each other. Here is a picture of me and Rosa covered with Dead Sea mud. The mud felt rough when it was dry, and it felt smooth when it just got on my body. It was very fun! Then me and my dad went into the Dead Sea and floated in it. I loved it so much! I really didn't want to stop! I'm hoping that soon, I'll have another really fun time like that again. Then we drove to Masada. It was very tall, and me and Dada and Tanya and Rosa all walked all the way up it. That was very hard! 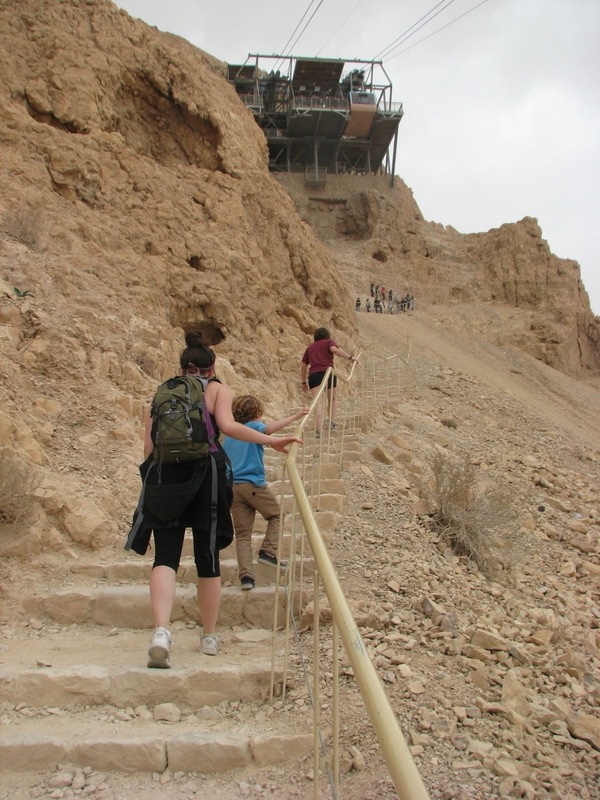 Masada was 350 meters high and there were over 700 steps. The Dead Sea is only 22 meters deeper! My legs were so sore, I would flop on the ground when I got to the top. The ruins up there were amazing! There were many things to climb, but I couldn't climb on them. This is our last night in Israel. We will leave early tomorrow morning. So I said goodbye to everyone in my family: grandma, Aunt Betty, Uncle Jon, Aunt Julie and Josh and Dana. I will say goodbye to Tanya and Rosa in the morning. The whole trip--I liked being with my family and having many people that I loved around me. Back in Jerusalem after a long and very enjoyable day at the Dead Sea and Masada. I'm packing for an early morning trip to the airport, so again, am going to just post a few pictures. Jonah and I will both write more tomorrow en route. It's Saturday night, which means havdallah--the division between Shabbat and the rest of the week. As part of the short service marking the occasion, we praise God for making distinctions, for separating, among other things, holy (kadosh) from ordinary (chol). Judaism loves these sorts of divisions. God creates the world by setting boundaries, by separating light from darkness, earth from sky, land from water. And our tradition is full of such binary categories: kosher or treif, permitted or forbidden, land of Israel or diaspora (chutz la-aretz), Jewish or Gentile. But one should be wary in making these simplistic distinctions. Our tradition places great stock in boundaries--yet it also recognizes that sometimes, boundaries blur. Life is more often played out in the center of a spectrum than at the polar opposites. Talmud recognizes that morality is complicated, that it tends toward shades of grey rather than black and white, good and bad. Not all differences can or even should be resolved. Sometimes the way of paradox, of "both/and" is much truer than divisions into "either/or." The sunset that marks the passing of Shabbat is neither day nor night. It is both--the slow, steady passage between one and the other, when light and darkness embrace--and it is, for this, uniquely beautiful. Here in Israel, people tend to define themselves as either dati (meaning, roughly, "religous") or lo dati ("not religious")--with "religious" being synonymous with Orthodoxy. This division does not serve liberal Judaism very well. We need to insist that one can be dati, fully and authentically religious, as a Reform or Conservative Jew. Indeed, I believe that one can find religious holiness in all sorts of areas that are typically defined as secular. As I've noted earlier, one of my favorite places in Israel is the Jerusalem zoo. When you go to this supposedly non-religious place, you see hasidic Jews, Arabs, secular Jews, Christian tourists, fourth-generation Israelis and new immigrants, all enjoying the magnificence of God's creation. What could be more holy? And what of efforts by ultra-Orthodox Jews to force women to sit in the back of Israeli buses--restrictions offered in the name of "holiness" but surely ugly and profane? So as we begin a new week, I will be looking to go beyond the simple division between holy and ordinary. I want to find holiness in the ordinary. That's one of the great joys of being in Israel. Judaism isn't something that happens just in the synagogue, a day or two each week. Jewishness permeates everything, which makes everything potentially holy--the whole big, ugly, beautiful, glorious mess that is life here.